Turgeon - officially the world's oldest active thoroughbred stallion, has died peacefully in his sleep at the grand old age of 33, with the news filtering through on Monday morning. Sheltered at Henri Devin's family yard in Haras du Mesnil - near Le Mans in the north-west of France, Turgeon leaves behind him a National Hunt legend's legacy having sired or grand-sired so many talented jumpers in recent equine generations. Siruh Du Lac became just his second Cheltenham Festival winner this year when landing the Brown Advisory Plate under the joyful Lizzie Kelly, after Chapoturgeon's success in the Close Bros Handicap Chase back in 2009; when it was known as the Jewson Novices Handicap. 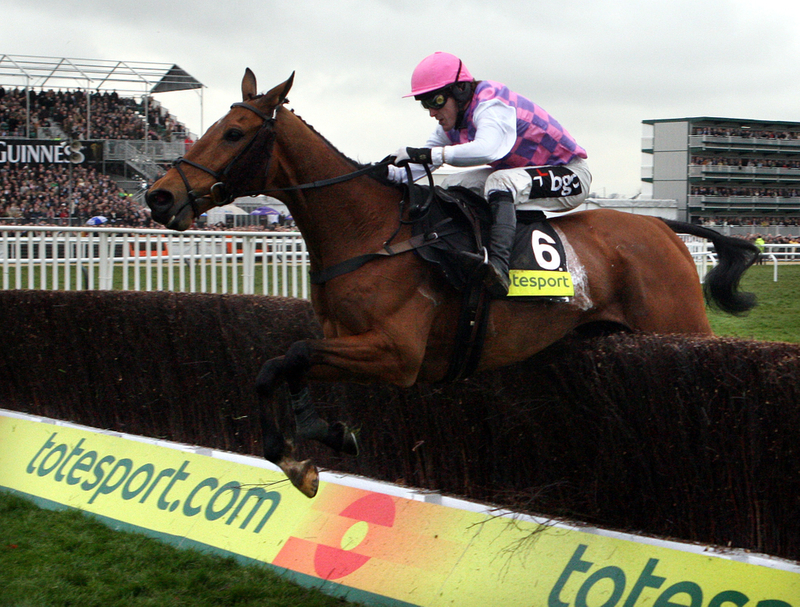 Another famous name from his offspring is none other than Exotic Dancer (pictured), who twice placed in the Gold Cup with Sir AP McCoy in the saddle, adding to his Lexus Chase win at Leopardstown back in 2008. His many daughters have also produced the likes of Aux Ptits Soins - successful at Aintree on Saturday and La Bague Au Roi - who has struck in four from her five starts over fences this season including in two Grade Ones for trainer Warren Greatrex. Champion Chase runner-up Politologue, The New One and Pepite Rose are other well-known names from his bloodline that have had very sparkling careers. Attentions now turn to his Topham Chase-winning daughter Ma Filleule, who will look to continue his fine reputation as a broodmare herself, after being sold for €220,000 at the Deauville sales last year. Foaled in 1986, Turgeon was bred in the United States but campaigned across most of Europe's leading flat meetings, including in France and in England and Ireland. Trained by Jonathan Pease, he made a winning start at Longchamp but only won once in his next six starts as a three-year-old, including the Group 2Two Prix de L'Esperance. His sole win as a four-year-old came in the Prix Vicomtesse Vigier, and really began to mature in time for an outstanding five-year-old campaign which not only included a second win in the Group Two just named, but also a fine line of high-profile victories in the Prix Kergorlay, the Irish St Leger and its French match - the Prix Royal-Oak. Turgeon then switched into the colours of Sheikh Mohammed, and although he was did not appear in the winners enclosure again from any of his next ten starts, he was a regular placer including finishing third twice in the Gold Cup at Royal Ascot in 1992 and 1993. Recruited by Devin to stand at Mesnil at the end of his racing days, Turgeon's staggering durability as a sire was again indisputable last year, after covering 26 mares at the age of 32.